Street markets are irreplaceable in Vietnam’s cultures, as they have been a means to make ends meet for the local people for so long. 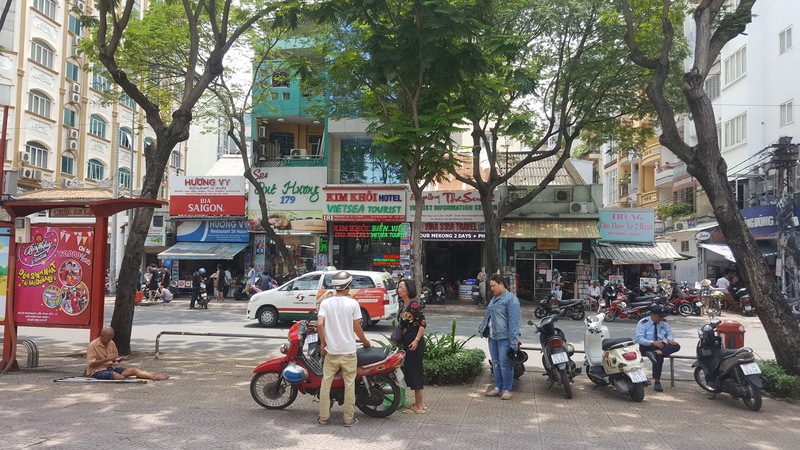 As time progresses, the markets have become a tourist attraction for foreign visitors, but they can be hard to find, especially in district 1 when there aren’t many markets beside the Ben Thanh market. However, at the start of 2017, the Sense Market at the September 23th Park became a phenomenon for its fantastic and diverse street foods, especially in Saigon street foods that can only be found in small street markets. Let’s dig deeper into the market and see what’s waiting. c/ Che or Vietnamese gruel. Not a single person would expect an average-size shopping center underground. Opened in 2017, Saigon Sense Market is probably the youngest shopping centre in Ho Chi Minh City. The centre has earned a reputation for being the best underground market in the South of Vietnam. Mr Lam Ho, the director at Business Investment of the Southern Region and primary sponsor for the Sense Market project, stated that the company’s wish to introduce Vietnamese cultures and cuisines to the world led to the birth of this market. 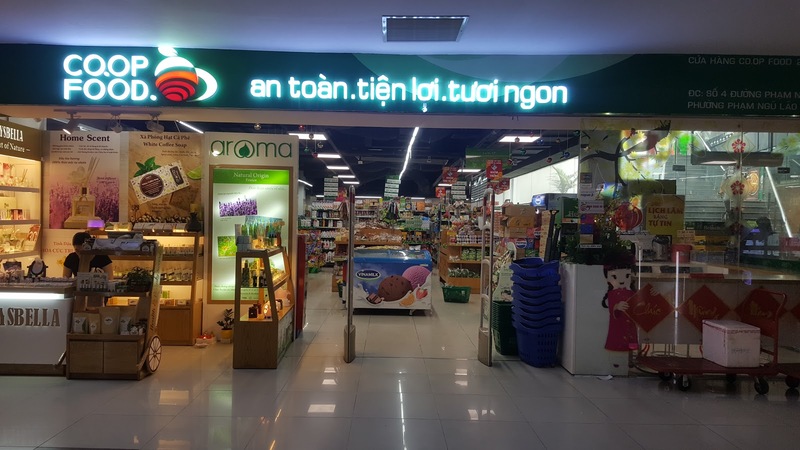 Though being a newcomer compared to other shopping malls and supermarkets in Vietnam, this market space, interestingly, was conceived around 20 years ago. Some Taiwanese investors intended to build the biggest shopping and financial centre at the time. Unfortunately, Asia underwent a financial crisis in 1997, causing the cancellation of projects including the Sense Market. The underground area remained used as a basement for keeping traffic-violating vehicles, which was left unsupervised and ended up causing infrastructural damages. It was not until the start of 2017 that investors started to invest in refurbishing the old and deteriorating basement. When the market was finished, it immediately became a tourist attraction in Saigon mainly for its cultural diversity in dishes and cuisines. The Sense Market, unlike other supermarkets and shopping malls, is unique for its distinctive location. Never before has a small-scale food court been located inside a park and under a stage at the heart of the city, making it very convenient for passers-by and tourists to fill their stomach and while visiting district 1. 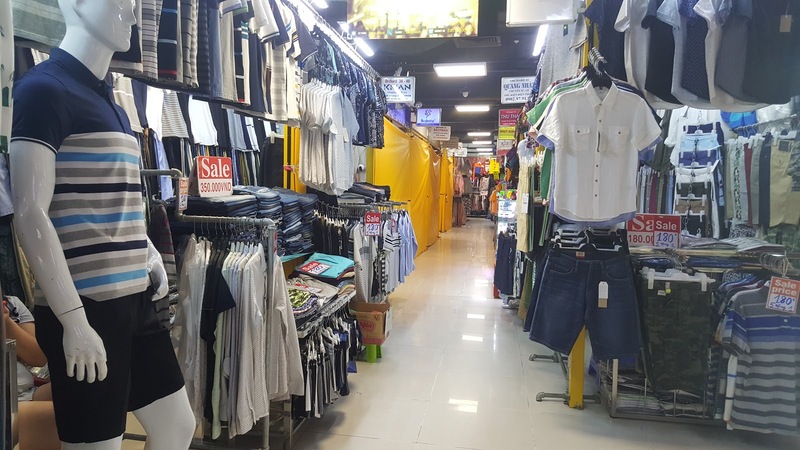 This is because the market is 10-minute away on foot from the Ben Thanh market and is surrounded by different services and stores. There are two zones in the September 9th Park with the market being situated in Zone B, facing Pham Ngu Lao street and Le Lai street. With such a convenience surrounding the park, the Sense Market can cater to every visitor’ needs. For its money-making location, a number of food store owners and investors decide to open businesses in the market in the long run. 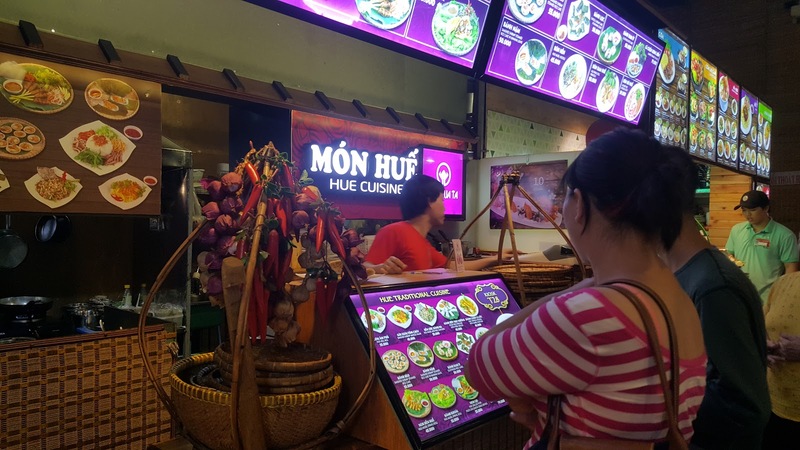 And they made the right decision – since its opening, Saigon Sense Market has consistently made into the list of must-visit tourist sites in Ho Chi Minh City, attracting hundreds of visitors every day. 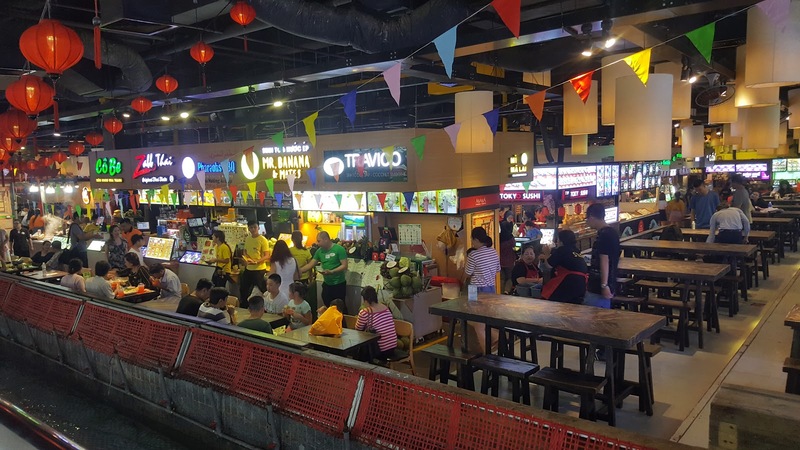 Whether you go to Vincom Plaza, Diamond Plaza, Hung Vuong Plaza, or any shopping malls in the city, it’s hard to find a place that has an underground food court and an environmentally-friendly park above ground. For travelers, especially Western travelers, they tend to prefer a place that they can walk for leisure after having meals, and the Sense Market ticks all of the criteria. Even if there is such a place outside district 1, the travellers might not consider going there since district 1 is the most visited and recognizable area in Ho Chi Minh City. The only shortcoming is the opening time. 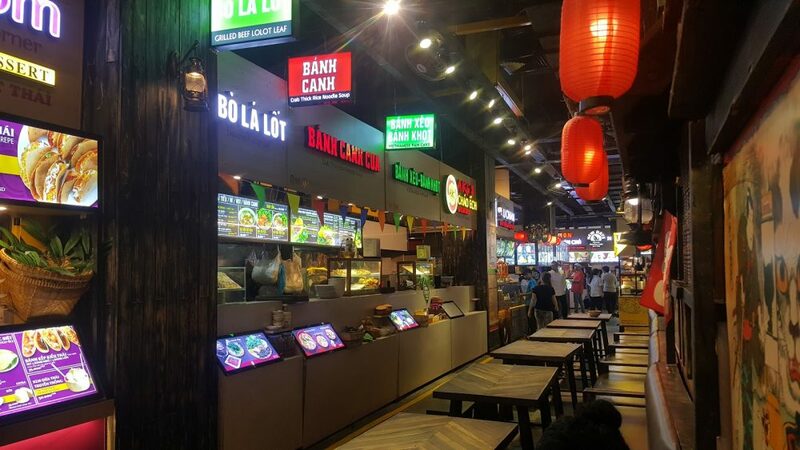 Due to the government’s regulations about running a business, the market is closed after 10:30pm, but that does not stop the market from being a candidate on the list of best markets in Ho Chi Minh City. 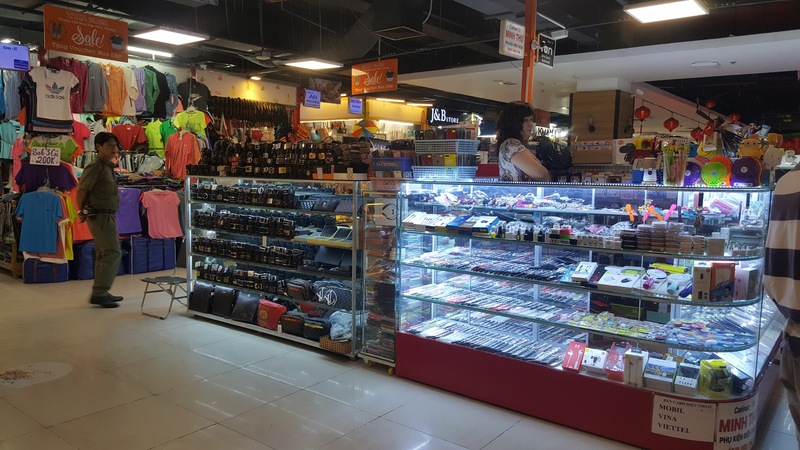 What distinguishes Sense Market from other malls in the city is the combination of a modern supermarket and a traditional food court that resembles street markets. 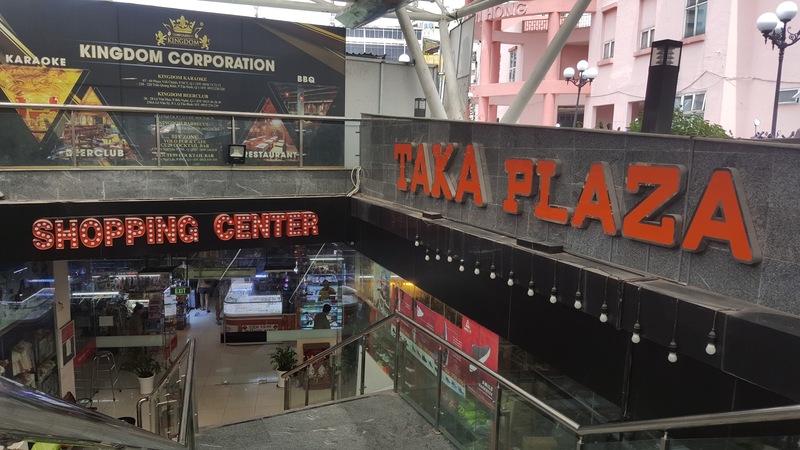 Taka Plaza, a shopping mall, is the first area to be in the visitors’ sight when entering the market. This 2000-square-metre mall contains more than 400 big and small fashion stalls, giving the visitors a range of product choices at reasonable and affordable prices. A corner of the shopping mall that sells handbags and electronic devices. The deeper you go inside the plaza, the more fashion shops you can find. If not satisfied with one shop, the others are always available for you. Fashion shops here can cover most of the visitors’ fashion taste and needs. The plaza also offers a number of services that include currency exchange counters and a Co.op Food convenient store. After visiting the Sense Market, the visitors can drop by and purchase daily products if they prefer, not wasting time going to another supermarket outside. Co.op Food, an inexpensive market in disguise, serves the local people with daily products. Children also enjoy hanging around in the market, as there is a playground equipped with the latest games such as Racing Cars, Mini Basketball, Dancing Stage, and Piano Tiles. At only 2000 VND per coin, people of all ages can have a great time in the market. Due to the close distance between the gaming center and the food town, children can get refreshments anytime they prefer. 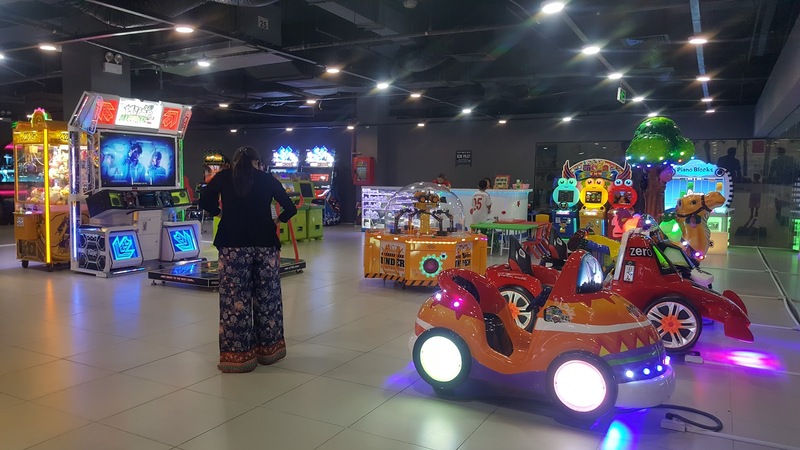 The gaming center is not limited to children only, as teenagers and adults can spend their quality time here playing racing games, shooting games and electronic basketball. However, at the moment the gaming center is limited in its selection. There’s plenty of space to add more so be sure to check back to be updated on any new additions! Kids may not be impressed with the food town, but this playground surely gets their attention. 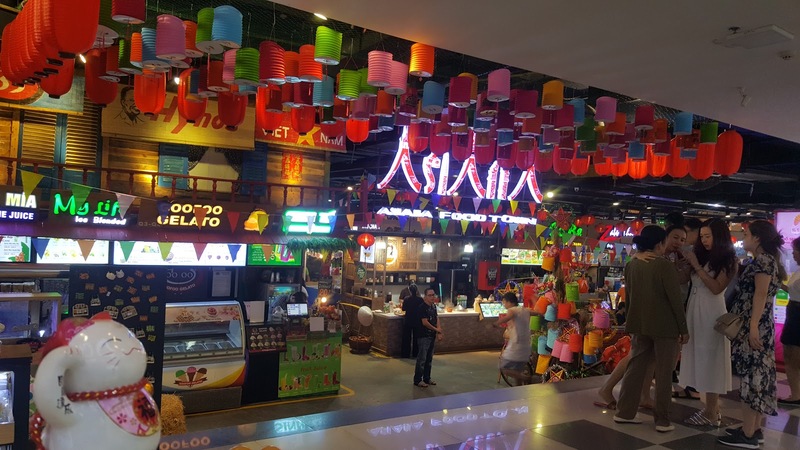 As impressive as Taka Plaza is, Asiana Food Town is the highlight of the market that leaves a lasting impression on the guests due to its decoration, arrangement among the stores, and dining vibes. Let’s go through one by one. The recipe for drawing the visitors’ attention is the food town’s rectangular shape and eye-catching decoration. Within an area of around 1,500 square kilometers, different cultures are demonstrated almost everywhere. The Chinese culture is the most evident, as there are Chinese Lunar Moon toys on the poles and Chinese lights, illuminated with the bright yellow color, hanging from the ceiling. This intelligent and sensible arrangement of decoration and colors is the key to increasing the visitors’ appetite due to the cosy feeling that the market brings to them. The moment they set their foot on the Food Town, the appetite is just irresistible. The decoration instantly reminds visitors of an old food town in China. The lights are brilliantly attached to the ceiling of the building, creating a solid background for the Food Town. Different food stores are closely positioned with a fairly narrow walking way that separates neighboring stores, ensuring the visitors that they can always find each other if choosing foods separately. Such a structure of organizing the food stores also shows how brilliant the designers are. This is illustrated by the closeness among the food stores that helps to connect different guests, as there are big seats for having meals on one side or right on the walking way. 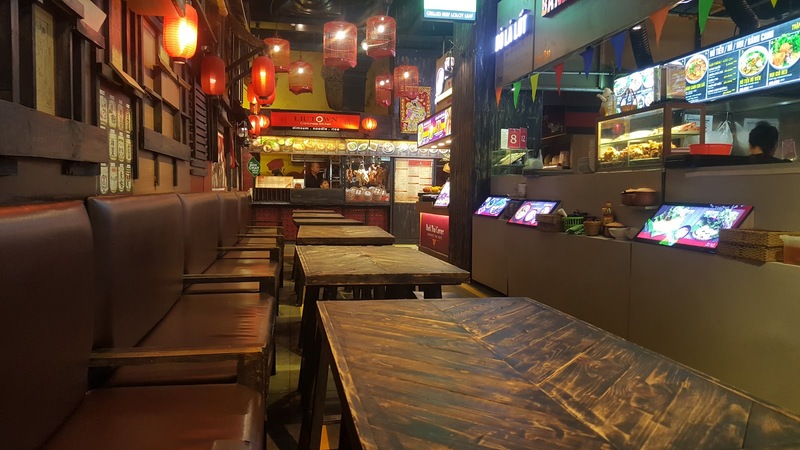 Such seats enable the diners to enjoy every cuisine presented in the Food Town, not being confined to one food shop exclusively like in other shopping malls. This is mainly due to the Food Town’s permission to have different dishes and foods in one table. Pizza is your love but your friends prefer Thai cuisines? No problem. Just order and the foods will be delivered to your seats. The tables are close to each other, which can be convenient for big families by joining them. This kind of walking way gives the visitors a cosy feeling when visiting the Food Town. Another key difference compared to other shopping malls is the dining atmosphere. 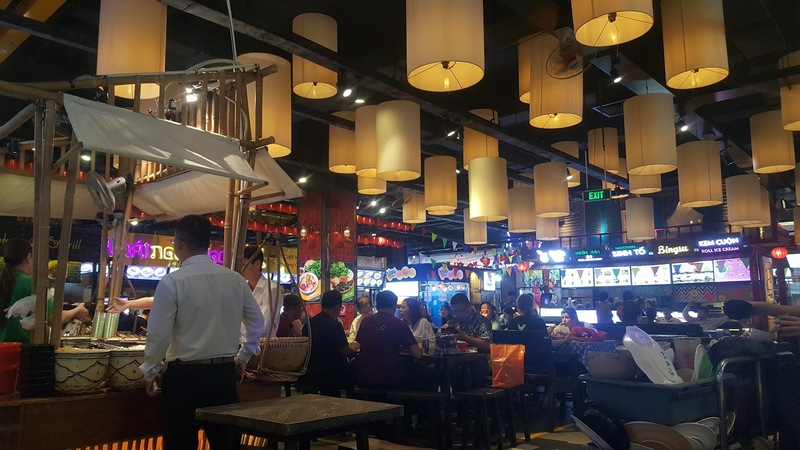 In terms of the dining experience, I find Asiana Food Town an ideal place for food lovers because unlike other food stores in big shopping malls, the Food Town gives the customers the feeling of visiting a Saigon market, a place for food lovers and critics. It seems to me that every customer is connected somehow, as their presence is established through the foods, enhancing the “eating spirit” among food-aholics that may lead them to a random conversation. 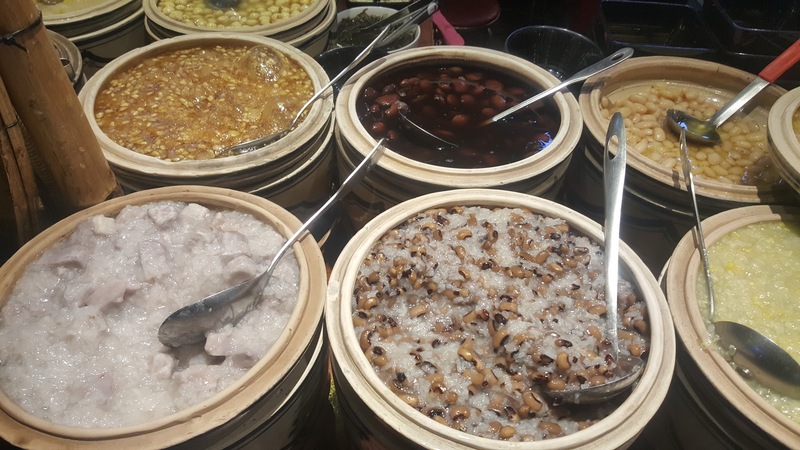 There is no separation among the customers in my opinion, partly because the area is warmly and closely arranged and different food cultures are presented right on the dining table. The seats look like they are covering the whole area, making it easier for waiters or waitresses to serve the foods. This bamboo basket with garlics and peppers hanging on the top is a typical Vietnamese image. 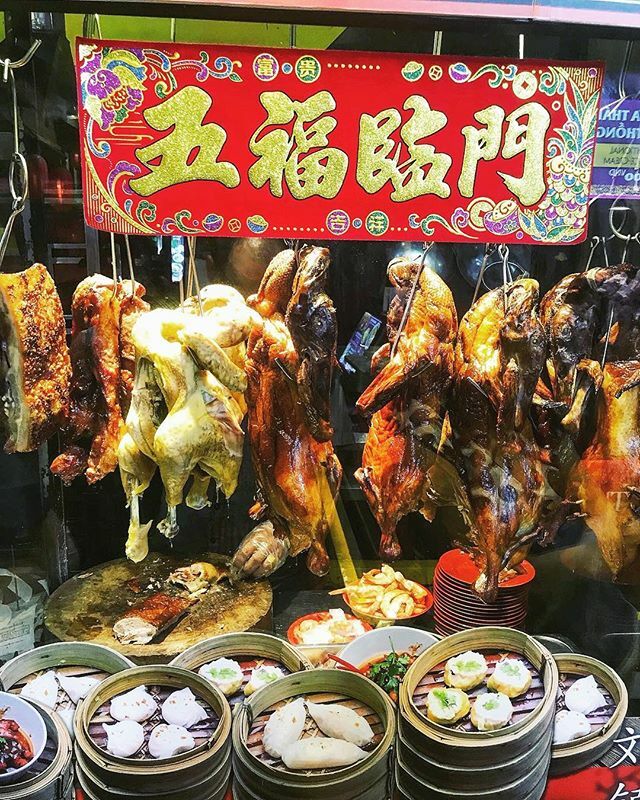 The Food Town should get the credit for being able to attract both the local people and foreign visitors, creating a mixed-culture environment that is essential in this era of globalisation. The Big Market or An Dong Plaza in district 5, for example, brings nothing new for the local people, isn’t able to bring in a lot of foreign visitors due to its location and difficulty in accommodating foreign languages. 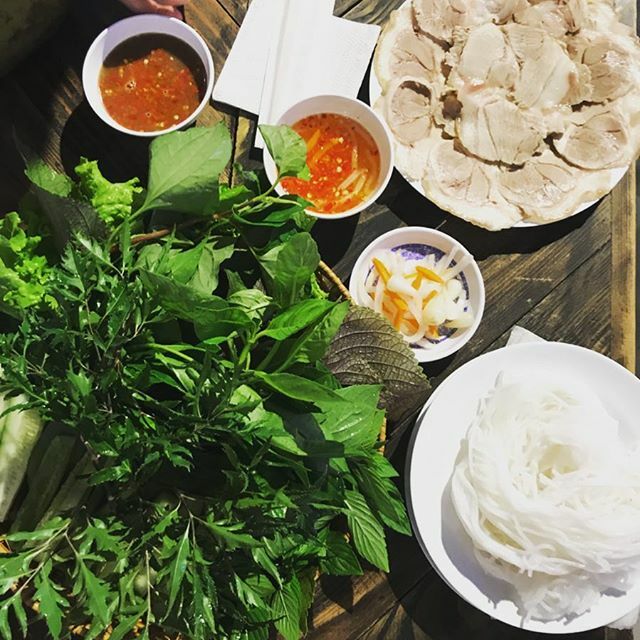 Though located in district 1, which has the highest number of foreigners, the Food Town still keeps the tradition that exists in Vietnamese dishes everyday, attracting even the local people who can always buy foods near their home. The Food Town reminds me of the street markets right next to my home, so even when I am sitting in a mall, I still feel familiar. The food stalls, especially those that sell Vietnamese foods, still keep their decoration in a very Vietnamese way. And now is the most anticipated section of this article: the foods. 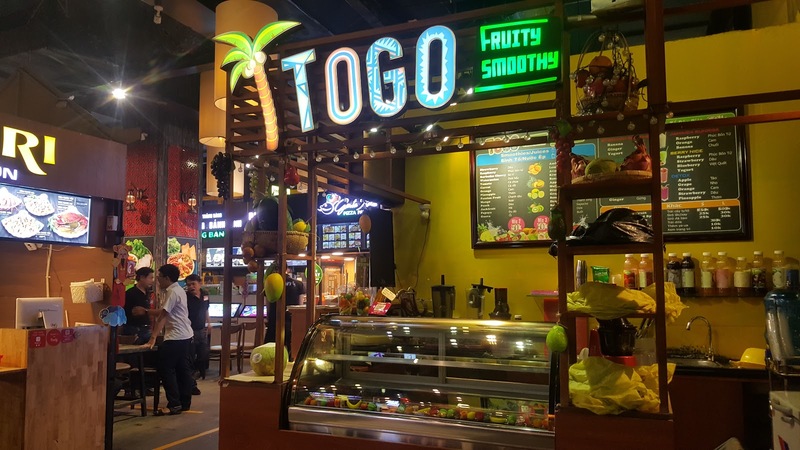 As I have mentioned, the Sense Market is well-known for its diversity in the food cultures and street foods with more than 50 food stalls in Asiana Food Town. The name might give you some clues about the type of foods here: Asian foods. From China, India, Japan to Thailand, Singapore, and Vietnam, the arguably most famous dishes around Asia gather in one place. The prices vary too, ranging from 20000 VND to 100000 VND depending on the foods purchased. Based on my visit, foreign foods cost slightly more than Vietnamese foods, around 60000+ VND and 45000+ VND respectively. However, I would like to focus mainly on Vietnamese dishes, as this Food Town is in Vietnam. Since trying every food there was impossible, I decided to try out some certain dishes that I think might attract the visitors. 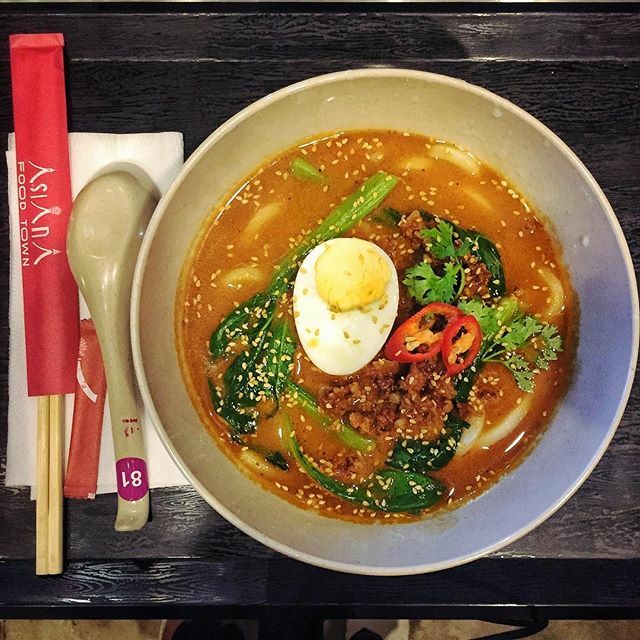 Thai foods are likely to be among a spicy eater’s favorite foods. For a hot pot, the price is reasonable since it serves 2 to 3 people. 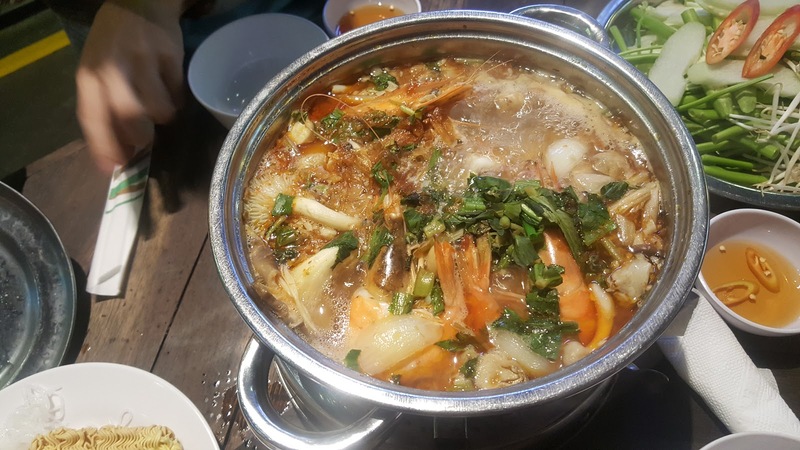 The hot pot has everything that a Thai hot pot should have: 3 pieces of shrimp, White Beech mushroom, Napa Cabbage, King Trumpet mushroom, mussel, and some other vegetables. In my opinion, the taste is fairly good although it should have been a little more sour, but overall this hot pot is of high quality. The visitors can order more noodles if they prefer, with each would cost 10000 VND per pack. 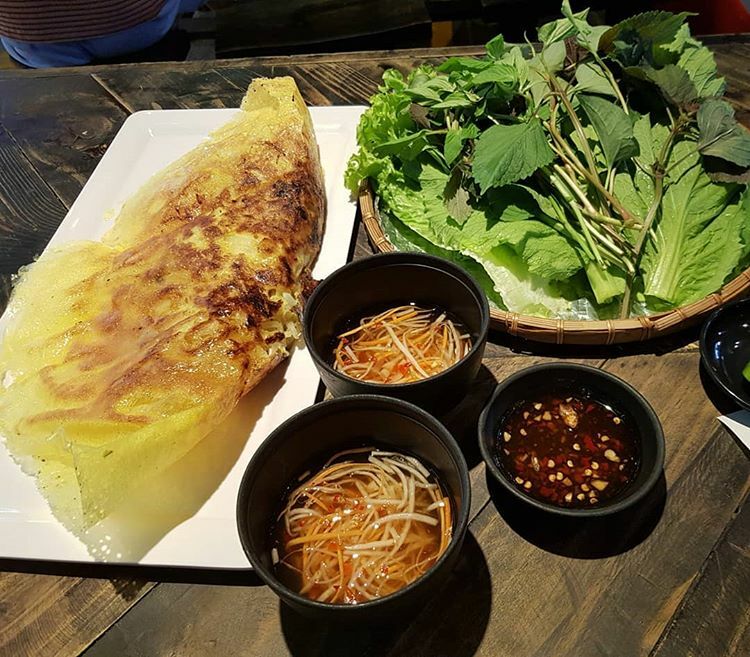 Vietnamese Pancake should be on top of the list of must-try Vietnamese foods. 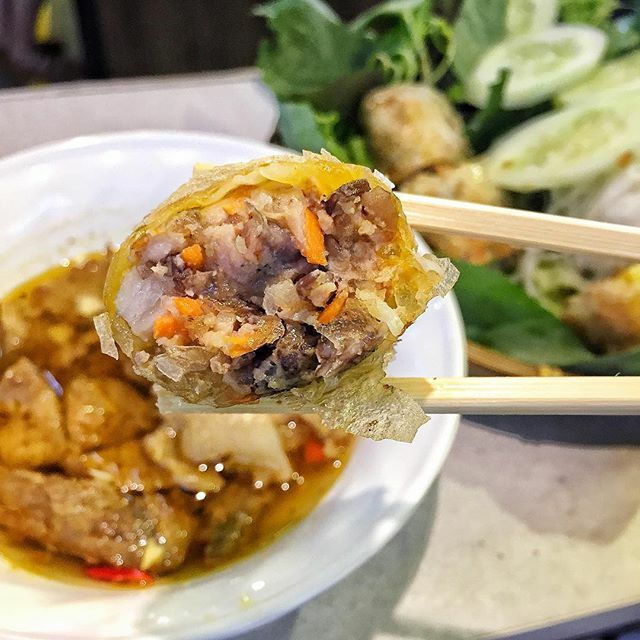 Categorised as an appetiser, Banh Xeo is one of the most famous Vietnam street foods, and it cannot be missed in a food fair like the Food Town. The dish itself looks like a crepe with shrimp and vegetables and costs 75000 VND. The taste is good and the crepe itself is crispy. However, the secret ingredient here is the fish sauce, contributing directly to the unforgettable taste that Banh Xeo is famous for. The sauce is cooked suitably to fit with the visitors’ taste, not too sweet and not too salty. Banh Xeo has a variety of flavours such as coconut, chicken, or beef, but I’d suggest the classics: meat + shrimp or the seafood flavour. Che is a classic dessert in the South of Vietnam. Having had two big meals, my friend and I decided to try out some desserts, and Vietnamese gruel is the choice. I had a bowl of White cowpea with coconut (the second bowl in the nearest line having black and brown peas), my own favorite, to see how it tastes compared to that of the place I usually have. And it did not disappoint me at all. The moment I had the first spoon of the gruel, I was instantly attracted by the recognisable sweetness that I’ve tasted for a long time. My friend did not order an original bowl of gruel, but instead he added some other flavours. He had a bowl of sweet lotus seed gruel with 3 pieces of Longan fruit as toppings. Despite his high standards and expectations of food, he finished the dessert very quickly because, according to him, the gruel was so refreshing. When it comes to desserts, Vietnamese gruel should pop up in your mind instantly, because it is Vietnam’s legendary street food. Looking for healthy drinks? You’re looking at them. 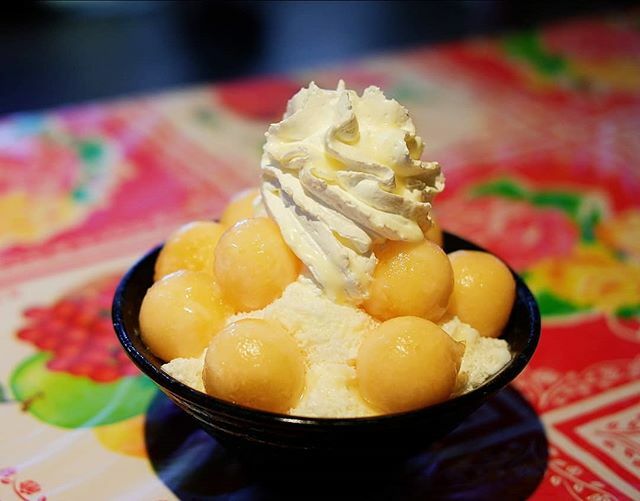 This cute little bowl is Bingsu, consisting of shaved ice, flavours, and syrup. The famous Bun Cha Ha Noi – kebab rice noodles. 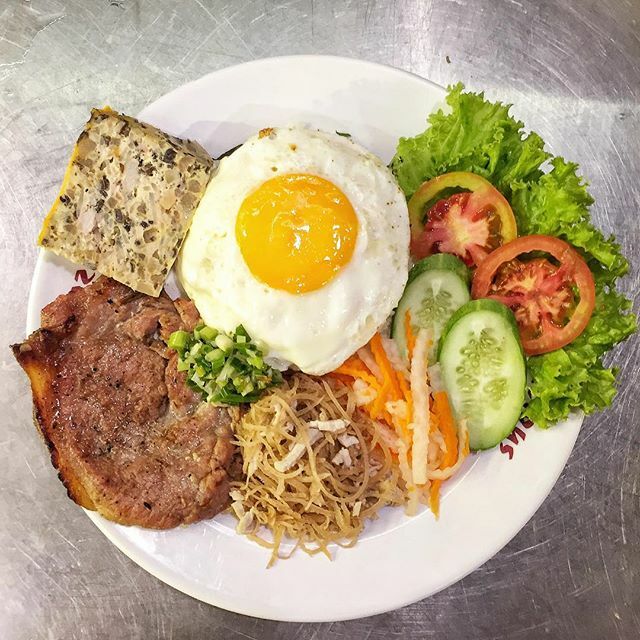 One of the most beloved Vietnamese dishes by the Southerners: Com Tam. One of Japan’s most popular foods for foreigners: Udon noodles. The Sense Market, especially the underground market Asiana Food Town, is definitely worth a visit. However, there is news recently that the centre is due to be closed at the beginning of 2019, so double check your travel plans and make sure you don’t miss out on this chance to visit a street market in Vietnam with such modernity. Come by and see for yourself! When I was in H C M C I ate at one of the places on the Food Court most every night. The selections are uncountable ! And all of them are healthy. If you are a”Foodie” this is the place for you ! O, B T W, There is a very nice young man that cleans the tables, please say “HI” to him and give him a small tip, and tell him that he’s doing a “Good Job”. The sad part is, after 2 years of enjoying this, in May 2019 it will be closed and made back into a park.